Spacious, airy and naturally /artificially well-lit classrooms provide the pupils with an ideal study environment. In order to maintain a good and ideal studying environment the strength of each class is limited to 30 students per class. This helps in providing individual attention to each and every child by the teacher. As over the last few decades, technology has made intervention in every aspect of our lives, the Classrooms of FLS couldn't be an exception. 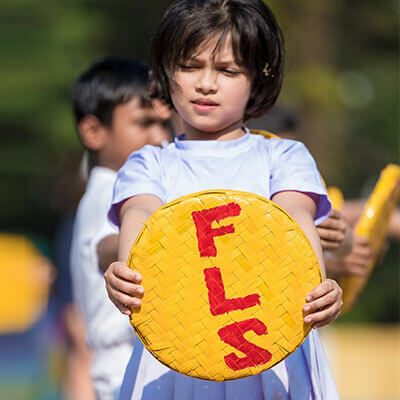 Keeping pace with the world’s best practices for effective teaching-learning, FLS took the initiative in the previous decade only and adopted Educomp "Smart Class" Technology for transforming the way teachers teach and pupils learn. Improving teacher effectiveness and productivity in class by making the concepts lively and thus, making the learning experience much enjoyable and fun-filled. Bringing about interactive learning process, formation of better concept, concept elaboration, improvement in reading skills and academic achievement. Enabling the teachers in designing instant formative assessment modules and evaluation.